Jade is the newest gem on the store and soon to be the "opal" of your eye. Her morphs were meticulously crafted in order to give her a grown up and yet very young and sensual look. 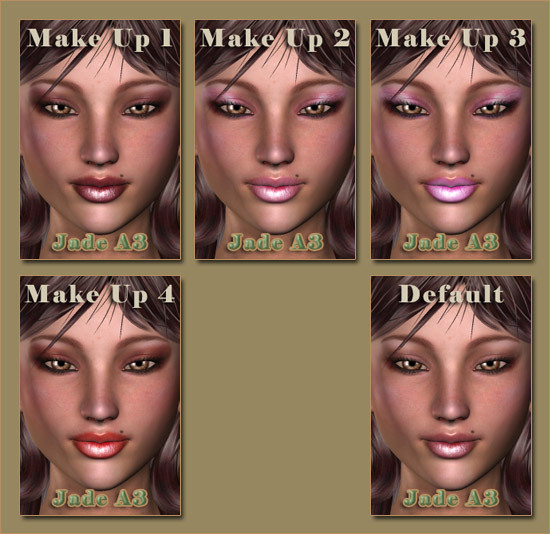 The skin texture has incredible realism and definition and the choices of make up, eye color and bonus second skin are sure to make Jade A3 a must have on your Runtime folder. Scroll down the page to view all options.
? If you wish to use clothing props for Jade A3 it is advisable that you do not install the body morphs on the character, unless the props have enough morph dials to accommodate the transformation of body parts.